The universe of baby products is unknowably wide, and for new parents, it’s tough to figure out which things are essential, and which you’ll take home and stick in the wardrobe with the tags on, never to be seen again. But we promise that these divine baby essentials will be on high rotation. If the classic Burpy Bib from Aden and Anais isn’t slung over your shoulder or in your hand wiping up milk spills, that’s only because it’s in the washing machine for the 10th time that week. Before you’re a parent, you might be vaguely aware that babies are constantly leaking, but until you’re a new mum on the clock, you won’t understand exactly what “constantly leaking” means. So much dribble and milk, all the time. 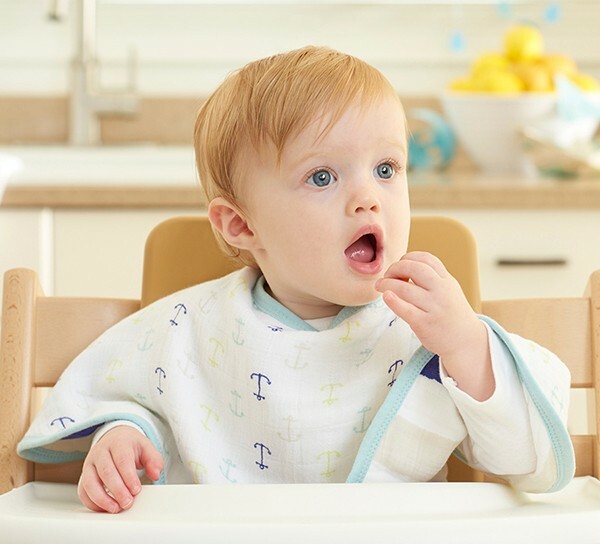 Burpy Bibs are made of soft, 100 per cent cotton muslin. They’re nice and big, shaped to sling over your shoulder, and the fabric is super absorbent to catch dribbles and burps and everything else. The only trouble you’ll have with these bibs is choosing your favourite print. Another essential for your list is a collection of wide muslins, like Aden and Anais’ Classic Swaddles. A muslin wrap is the ultimate multi-purpose item – you can swaddle your baby, use it as a breastfeeding cover, tie it to the pram for a make-shift sun cover, and you can even fashion it into a cloth nappy if you run out of supplies when you’re out and about. The Classic Swaddles (above) are 100 per cent cotton muslin, they’re generous 120 cm squares, and come in prints like jungle animals, stars and stripes, or graphic shapes. While these swaddles already start out super soft, they get even more lovely with every wash. That’s good, because they’re going to get washed a lot. Real estate in a nappy bag is precious, and no one wants to cart around two of anything. That’s why we love this divine Soothing Ointment – scented with Australian sandalwood – that mums and babies can share. Created by Aden and Anais alongside a leading dermatologist, this staple is perfect for tiny dry elbows, and hard-working mama hands. New mama, you’re going to do great. No matter how prepared or unprepared you are, these essentials from Aden and Anais will make life easier, so you can spend more time getting all the newborn cuddles.